Prestige Watch will gladly pay for free Ground shipping for every order valued over $100 via UPS or USPS depending on the order. However, should you return an item, the cost of shipping will be deducted from your total refund. Every item shipped out of our warehouse is fully insured by UPS or USPS. Orders outside the 48 continental States require Second Day or Next Day Air service. APO or FPO address requires United States Postal Service Shipment (USPS) Option. Delivery time via Ground can range from 1 to 6 business days. Please view the provided map for transit time estimation. All items are shipped insured. 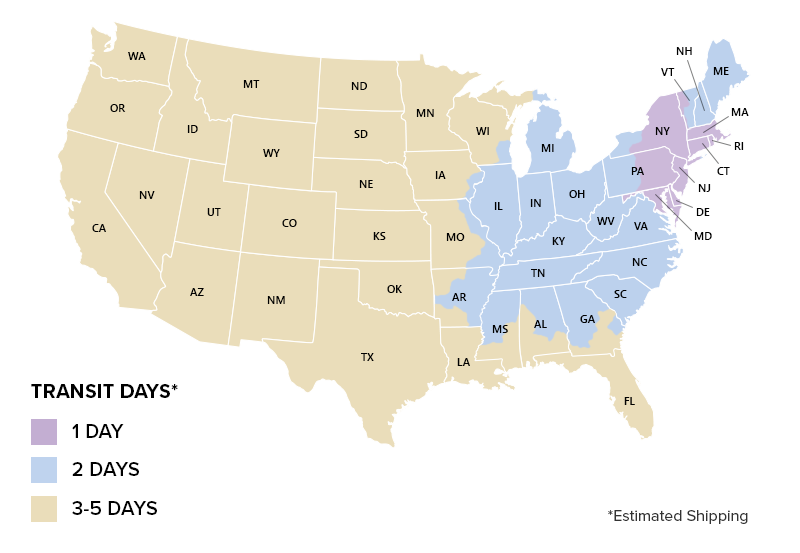 Note that air and ground shipping times are measured in business days. Next Day Saturday delivery option is available only in the United States. Prestige Watch provides insurance coverage for every item we ship out. You may be asked to sign for the package upon delivery. If a shipped order was lost or damaged, UPS or USPS must conduct an investigation. Please contact Prestige Watch to initiate a tracer within 10 business days of the item shipping from our warehouse. If the package is not located, UPS and USPS will process a claim for the package. Claims can take two weeks to process. When the carrier claims responsibility for the loss or damage of your shipped item(s), insurance reimbursement will be issued to Prestige Watch and the replacement item(s) will be shipped out. If the item(s) is no longer available, and a similar item is not wanted, Prestige Watch will gladly refund your original payment. When your order is received, if there are any noticeable discrepancies with your item, or if the item is different than what was ordered, please contact Prestige Watch within 5 days of receipt of your shipment to make any necessary corrections. Please read our International Orders section below for International shipping problems. If the item received is different than what was ordered, please contact Prestige Watch within 5 days of receipt of your order. If you believe that your automatic watch isn't working properly, please click here for more information. Product discrepancies not notified to Prestige Watch within 5 days may not be honored for replacement. Please contact us within 5 days of receipt of your shipment if your item is defective. Note: Errors or omissions in descriptive, typographic, pricing and/or photographic representation are subject to correction.